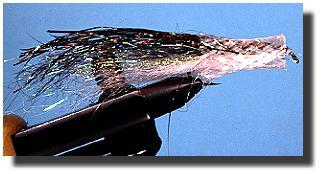 Poxy Head Minnow - Fly Angler's OnLine "Intermediate Fly Tying Part 45"
We've touched a little on flies that can be used in saltwater. 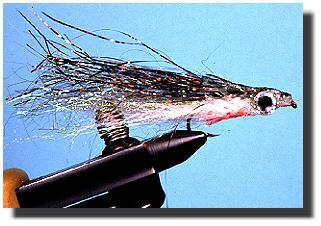 The Clouser minnow is one of those great saltwater flies. 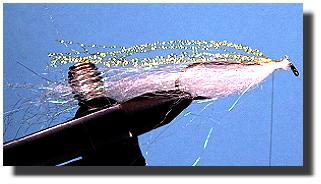 In fact, you already have most of the skills and techniques needed to tie saltwater flies. There are a few techniques we need to cover, but you are an accomplished tyer already if you've mastered all the techniques we've covered in this series so far. One of the techniques we haven't covered is working with braided mylar tubing for bodies or heads. 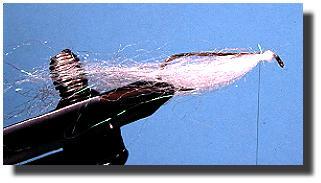 This is the tubing that gives the bodies and heads of streamers, especially saltwater flies the flash and glitter that attracts predator fish. The braided glitter looks a lot like the flash of fish scales in the water. 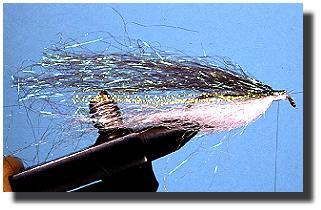 Although mylar tubing is used a lot in saltwater flies, I usually use it for pike flies. 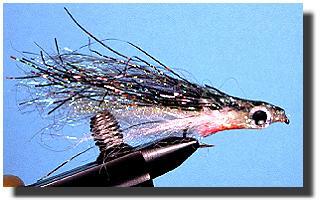 This week's fly is one of my favorite pike flies for clear water and sunny days. Big toothy critters find it hard to resist any fly that looks like a tasty minnow that's about to expire. Largemouth bass also have a hard time resisting this look. If you live in lake trout country, this is a great searching pattern for the first couple of weeks after ice-out. 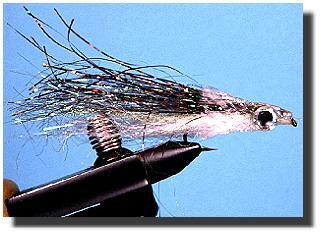 You'll probably wish you had learned to tie this fly earlier after you fish it for ice-out lakers. 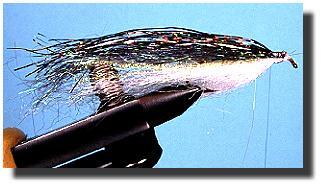 They don't pass up an easy meal very often, and any fly with the flash this fly has will be a prime target in springtime shallows when the lake trout are shallow and hungry after a long, cold winter. I'm not an expert on saltwater flies. I don't know everything about which flies work for which species of fish. What I do know is there are some techniques that are commonly referred to as saltwater tying techniques that also work very well for freshwater fish. One of those dynamite techniques is applying epoxy (Angler's Choice soft body here) over a mylar tubing head or body. You can use the techniques shown here to create many different flies. Change the body colors and materials to anything you like. Use different colors of mylar tubing if you like. The important thing is that you learn how to use mylar tubing and epoxy style finishes. Add any good pattern book, and you can proceed from there if you know the techniques. I like to use pearl mylar tubing because it provides all the flash, but lets the colors of the fly body show through. The addition of prism eyes adds a little more flash. Use a lot of crystal flash, holographic flash, and other flashy materials to achieve the fish catching look you like. Head: Pearlescent mylar tubing with epoxy or Angler's Choice Soft Body finish. Eyes: Prismatic, glued on and covered with head finish. 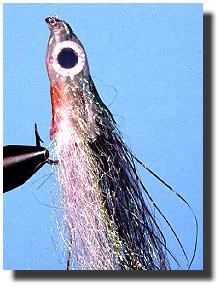 1.Start the thread and tie in the lightest colored body material under the hook. 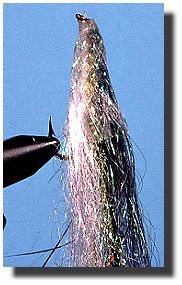 Angler's Choice Poly-Bear hair is used in my fly. 2.Next, tie in the second lightest color on top of the hook. In my fly it is chartreuse crystal flash. 3. Add the third color, progressing from the lightest colors on the bottom to the darkest colors on top. My fly uses Poly-Bear for the third color. Try to keep the length of all the body materials the same. 4. Tie the darkest material on the top. Holographic flash used here. Don't let the materials spin around the hook. Once you have all the body materials secured to the hook, whip finish the head and trim the thread. 5. Cut a short section of pearlescent mylar tubing and slip it over the head as shown. 6. Start the thread again behind the hook eye. Slide the mylar tubing forward to the hook eye and tie down the front of the tubing with two loose wraps of thread. 7. Secure the mylar tubing tightly behind the hook eye. Whip finish and trim the thread. 8. Dip the head and mylar in Angler's Choice thin Soft Body resin (epoxy will also do the trick). Allow it to dry for a moment. 9. Glue on the prismatic eyes with a drop of thick Soft Body resin. Let the fly dry for a while. 10. Use waterproof markers to darken the top of the mylar, and a red marker to give the bottom a little red color. 11. Dip the head in thick Soft Body resin. Smooth the resin back toward the tail with your finger. Cover only the mylar with the Soft Body resin. Set your fly aside to dry out a bit. 12. When the resin dries, it will be clear and let the colors and flash of the fly body and mylar tubing shine through. Epoxy can be substituted for Soft Body in this pattern. 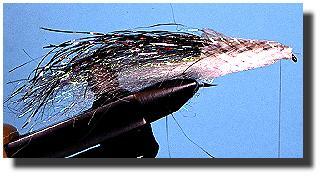 The more flash you can give this fly, the better it will catch fish. Fish it with a jerky retrieve.